December is always such a fast moving month as there is so much to do and you always have friends that say “we must catch up before Christmas”. Well it is only weeks away and I have no idea how I am going to do that unless I book lunch, dinner and drinks every night starting 2 weeks ago!!!! And unfortunately – not this year. I have been trying to teach myself various new skills mostly by webinars and top that with lots of reading, I have found my days are going even faster than when I worked full time in a law firm. The only thing I stress about (which is major) is how to pay the rent. But if money was no issue, I would have to say I am the happiest I have ever been. There is something so rewarding about just worry about yourself. Having the time to do everything and anything you want. I have literally lived on my computer for the last 3 weeks but alas, do not feel I am getting too far. So when I thought I should give myself a break, I thought I should blog away. So let’s get stuck into what Thoroughbred Events Australia has been doing. This month I have started looking at venues for our up and coming millinery event in March. The date is now confirmed – Sunday, 5 March 2017 which is just 2 weeks prior to the running of the 2017 Golden Slipper. So don’t leave getting your outfit organised too late. Either have an outfit in mind and search for that FABULOUS hat or come buy a FABULOUS hat and go on the lookout for an outfit to match. The lunch will be at PARKROYAL Darling Harbour where I have just built a lovely relationship with some key players. They are looking forward to building a relationship with our events so we can return prior to each racing season. A few other ideas are up my sleeve too. These events continue to grow and I can’t thank enough all the milliners that have been contacting me who would love to be part of it. I am trying to learn as fast as I can more ideas on best way to market the event so that as soon as we expand our guest list then I am able to include more of our talented milliners who are super keen to join our day. There is SO MUCH talent out there. From such humble beginnings where there were only a handful of milliners to now more than I can even keep up with – my my the millinery world has grown. Yesterday was a very special day for the Cornucopia Committee – it is the day that they present their cheque to various Sydney hospitals who deal with trauma with regards to the prevention of child abuse. These women continue to amaze me the incredible work they do and the money they raise. I was fortunate to have been on the committee for a while and still continue to show my support where I can. I am actually their official photographer these days which I do with pride. The day was incredibly beautiful with the event hosted at The Royal Oak Balmain. Well done girls. I look forward to next year which will see an increase in events on their calendar. Well we are back at Royal Randwick on Saturday, 17 December so we thought we would get a few of us out to the track together for a little celebration. Heading to the Old Members’ Lawn near where the winning horse comes back to scale – of course weather permitting – for our sip. It is the running of the $250,000 Group 2 Inglis Villiers Stakes. Should be a good day out. This is a race for 3 year olds & up with a distance of 1600m. It is also time for the babies to come and play with the $500,000 Inglis Nursery (Listed Restricted)- 1000m (2YO)(Set Weights) (Colts & Geldings- 56.0 Fillies- 54.0) restricted to only those horses nominated for the Inglis series. This also applies for the $250,000 Inglis Sprint (Restricted)- 1100m (3YO)(Set Weights) (Colts & Geldings- 56.0 Fillies- 54.0) The other races are the running of the $125,000 Green Options Razor Sharp Handicap (Listed)- 1200m (3YO&UP) (Quality) (HHW 62.0kg- LHW 54.0kg) and the $125,000 Christmas Cup (Listed)- 2400m (3YO&UP) (Quality) (HHW 62.0kg- LHW 54.0kg). 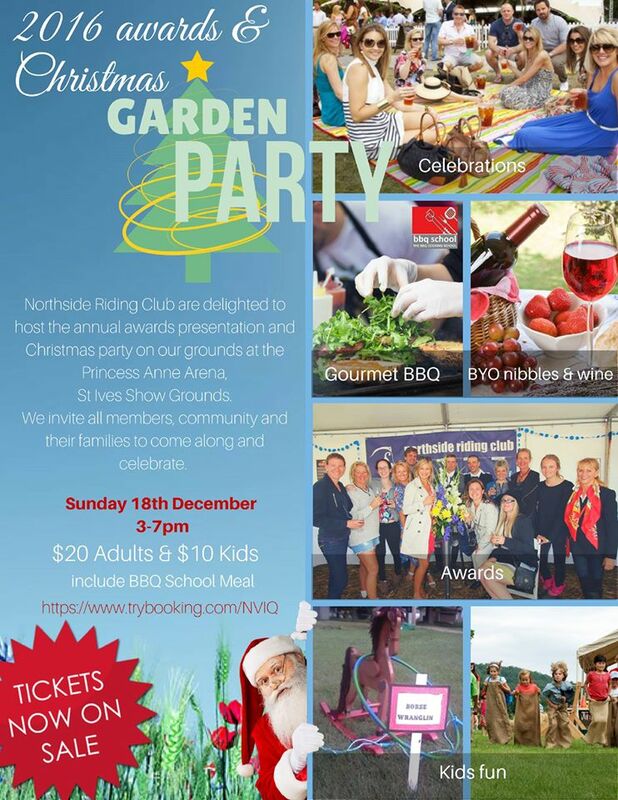 On Sunday, 18 December we are off to Northside Riding Club to present 3 outstanding achievements awards to the best off the track thoroughbreds at show jumping and dressage. It does not matter which category, it is based on their achievements and where the horse has come from. We are after the journey from track to their new career. If anyone is interested in attending, please let me know as it will be a great day and I would love your support. So for now, I wish you all a very Merry Xmas. When you get to 25 December stay save, enjoy the day with your loved ones and may your day be full of LOVE and JOY.